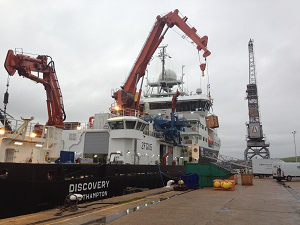 UK Shelf Sea Biogeochemistry Blog: Loading the ship begins…. 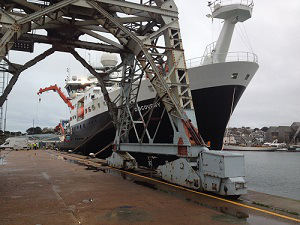 The various groups of scientists gradually began to arrive in Falmouth today. People have travelled from Plymouth, Norwich, Oban, Aberdeen, Southampton, and of course Liverpool. Each van load of equipment was loaded onto the ship, and stacked in the ship’s laboratories. Tomorrow the hard work starts, sorting all the boxes of stuff into the correct labs, setting up all of the equipment and beginning to see if it all works OK after the journey here. The plan is to sail 0830 Sunday morning. I met the captain to chat about the plans for the next few days. This is her first cruise as captain on this ship. Before this she worked for several years with the British Antarctic Survey on their research vessel. It’s interesting to see how things have changed since my first cruise way back in 1989. Then the crew was entirely male, and the scientists tended to be predominantly male. This is my first cruise where there are more women scientists on board than men, and the ship has several women, including the captain, one of the engineering officers and the head chef.